This Website is primarily an opinion piece & I dont claim to be an expert in any of the fields I might cover apart from in so much as my own personal first hand experience. Even so, there might be something in here you might find intresting, so go ahead, have a look around. Some of the links/pages are almost a web-log on the various subjects highlighted in the pages, cycling – MTB , my motorcycle (currently a Ducati 748 Bi-Posto 1997), other things I enjoy. Which is why I have called this site “Marx Garage”, in that it’s usually in the garage where you would find all the big-boy’s toys. -Drive chain, fuel injection settings, valve clearances, wheel bearing, steering bearings, general inspection etc. One of the 2x mounting bolts on the countershaft sprocket had snapped, they ‘tapped’ the remains of the bolt to replace it with a new one. The Countershaft sprocket is held on by 2x bolts that fix a plate that ‘locks’ the sprocket into place, you would need to lose both mounting bolts & have the retaining plate rotate 30 degrees before the sprocket would even begin to drift on the output shaft. I didn’t feel any drive train ‘looseness’ or noise so it was a surprise to me that the mounting bolt snapped in the first place. With the standard countershaft sprocket cover in place you cannot easy inspect the sprocket without removing it. I suppose it’s a good argument for a ‘cut-down’ race or smaller retaining cover instead so you can see these things before you ‘feel’ them. Also when inspecting the valve clearances the forward- horizontal piston’s right inlet valve lifter had a shattered collet, which fragmented from 2 halves into four pieces, but still remained in place on the valve stem groove. Not a major issue in that the collets sit fixed between the shim buckets within the groove in the valve stem, the fragments of the collet were still fixed tight when the engine was operating & only worked loose when the rocker arms & shim buckets were removed off the valve. Although this might explain the large clearance measurement I found of that very inlet valve when I checked it back in 2002. Even though the clearance measure was greater than the ‘ideal’ setting it was still within service limits so I left it. One of the mechanics there said that the collett may have shattered after some prolonged high rpm running with clearances greater than the ideal. I noticed on the ride home that the idle was set at 1300rpm instead of the 8-900rpm previously, not sure if that was how it should be but it just felt odd sitting at the lights with the tick-over so high. The cost was $1223.90 in total. Yep, not cheap at all. Anyone reading this might think servicing costs for Ducati’s are outrageously expensive, which they are & have been for a very long time now. Even though Ducati are addressing this issue with their new models (ie: ’07 2 valve Desmos like the Multistrada & Monsters will see 40% reduced servicing costs & higher mileage between major servicing intervals) anyone like myself owning a Desmo-quattro ’94 to ’05 will continue to fork out handsomely. Although this is mostly labour costs & if you can do the work yourself you can save some big dollars & perhaps gain a deeper understanding of these magnificent machines. January 28th 2006 – 8hr MTB Race Hard Day At The Office – 9am to 5pm. 1st attempt at endurance MTBing. Teaming up with mate Paulie on his Specialised Hardrock, I was astride the mighty Specialised Stumpjumper hardtail (team: Flatbar Matadors). Run by the Fat Tyre Flyers, the venue was in & around the bush at Whittlesea’s scout camp just 5kms north from Whittlesea. New bike: Kinesis (cyclocross) road bike. Bought 2nd hand out of the Trading Post. The seller originally had it built up for him (it’s not an off-the-floor bike) when he was in the UK in 2002 [original receipt provided for verification] . It’s essentially a cyclocross prepped bike but a change in tyres & maybe a larger chainring up front (TBA) should make it a sturdy & flexible roadbike I think. It's in great nic, but it does look like it's done a few miles, maybe even offroad (orginal brake pads are histroy, braking surface on the rims aren't too flash). Got it at a great price [cash talks], enough for me not to worry about forking out for replacement tyres & bike comp. See more in My Ducati 748 album. 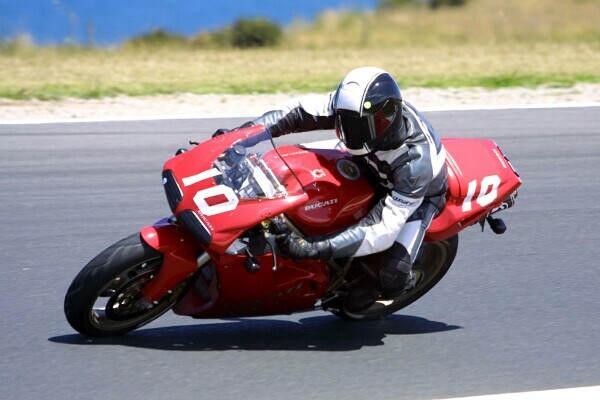 My Ducati 748 @ Phillip Island 16th Dec 2002. 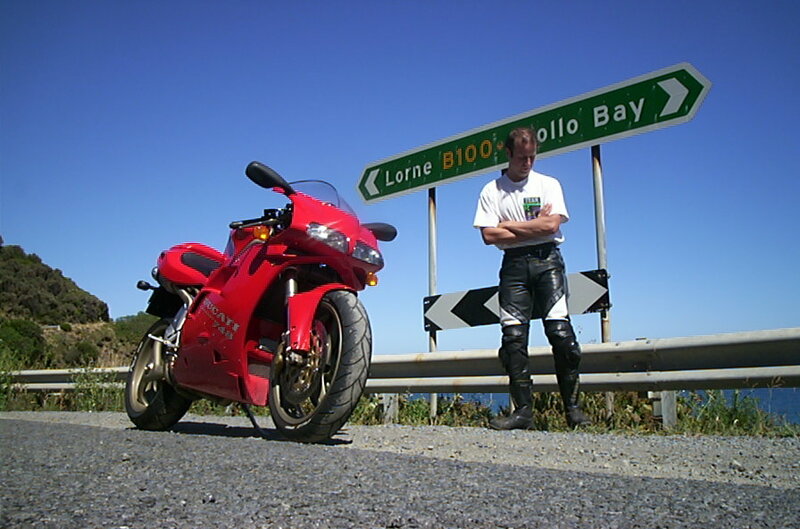 More adventures with my 748 in Ducati Diary. 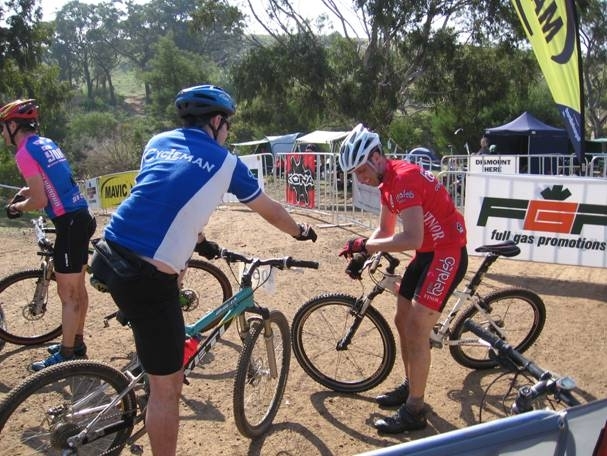 FGP 12hr MTB Sept 06, I'm (red) handing over to Phil. Just your regular sort of fellow, doesn't smoke, choof, pop, booze about too much or get involved with the constabulary on the weekends. First generation Australian from north/eastern Italian - Trieste ( http://www.trieste.com ) background, family emigrated to Australia 1956-61. Speak English & Italian (dialect). Baptised Roman Catholic . One older brother. Motorbikes: Ducatis - for they will always be what they are, KTMs - Dirt cred & their recent road range is out there & making friends, Honda Fireblades - not always the fastest or the best but can always be there to make biege look like dazzling biege , Vespas - 2 strokes are cool & steeped in history & legend, Nakeds - the stripped back motorcycle is how it should be, you want bodywork buy a car, Supermotards - start with a mountain goat & make it into a race horse that likes mountains. Music/Bands: Pixies, Beastie Boys, Rocket Science, Nirvana, Prodigy, Pop Will Eat Itself, Bjork. Movies: Star Wars, 2001, Fight Club, Mad Max 1, Blade Runner, Lock Stock & 2 Smoking Barrels, Giant, The Italian Job, On any Sunday 1. Stuff with bikes in it but only when their riding on the left hand side of the road. Television: Thunderbirds, South Park, Sienfield, MotoGP/bike racing, channel 10's RPM programme, Cycling events.., SBS late night & ABC's rage for consistany. Roads: Reefton Spur/Lake Mountain, Great Alpine Way Victoria, Phillip Island race track, Great Ocean Road Victoria. Foods: Pizza, Satay anything. Anything really, how can you not like eating? Drinks: Red Wines but not Shiraz, basic spirits, domestic beers. Coke, Baileys, actually quite a bit of water because boozing too much slows you down everywhere. Books: American Psycho, Dune series, but who reads books nowadays if you don't take public transport?. Motorbikes: 4-stroke scooters, BMWs weird collection, Moto Guzzis, crusier types. To be honest I could actually like any one of these bikes, but it's the owners that put a dark cloud over the whole thing. Some riders just have no idea & they make it obvious to the world. Some people are out there buying bikes & riding them all for the wrong reasons. Music/Bands: Idol, or Idol-esque type of thing. You know , too many key changes, vocally showing off . It should be about the music man. Movies: Hating movies is easy. Just watch one for the first time. If you can guess the characters types, the plot, where the twist will be & who triumphs in the end, you've got the one I hate. Television: The kind that makes you angry by reinforcing something you already know. I dont want to die without any scars. Your wealth in found in the hearts of others. Into motorbikes since 1982. MX/XC 1982 - 1994. Road 1996 - present. Competed C grade MX, state level 1988 - 92. Enduro - clubman class 1989 - 1994. No road race exp. Licenced to ride on the road 1986. No major incidents. Bike related injuries: Broke collar bone 1993 Broadford MX track on KTM125XC 92, practicing. Left knee ligament injury 1990, inter-club MX Heathcote track on KX250 88. Dislocated right shoulder 1989 inter-club MX Monza park track, riding KX250 88. Facture rib 1993 Alpine enduro state round riding KTM125XC 92. On my road bikes - little finger on my right hand crushed in a little off Sept 04.Plus various cuts & bruises from little offs here & there. Nov 2004, banged up my little pinky on my right hand in a small off riding the Ducati 748.